An updated look at progress made on Apple’s under construction Campus 2 over the last month arrives today courtesy of two new flyover videos. 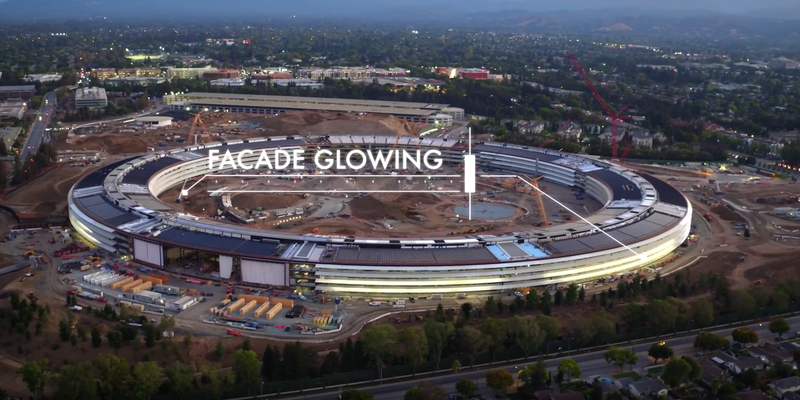 Of note, this month’s update from Duncan Sinfield shows that Apple has flipped the switch on some exterior lighting on the facility that makes it much more visible at night. Apple also continues with landscaping as more walking paths and finishing touches are applied to the courtyard’s gardens and the green areas surrounding the main circular structure. The company has made a lot of progress on planting trees and the massive mound of dirt on the site continues to shrink as landscaping work progresses. Another flyover video, this one from Matthew Roberts, notes that approximately 40% of solar panels appear to be installed on the main spaceship building, while several buildings separate from the main campus including the R&D facility, the fitness center and parking garage, and buildings along Tantau Ave., have quickly taken shape over the last month. Apple last confirmed earlier this year that it expects to move into the new campus sometime in early 2017. That lines up with the general construction schedule that the City of Cupertino has on its website, which shows Apple plans to complete building construction and work on surrounding street utilities by the end of the year. Once complete, Apple plans to move in approximately 13,000 of its employees into around 2.8 million sq ft of office space on the 176-acre campus. An underground auditorium at Campus 2 that Apple refers to as the Theatre will play host to upcoming Apple events. Head below for the full flyover videos in 4K. You can catch up with all the latest and previous Campus 2 updates including drone flyovers, news and more in our ongoing construction progress timeline.